I was totally overwhelmed and touched by all the birthday wishes I received last week! My thanks to all of you that sent messages through Facebook, ultimately bringing the social networking goliath to its knees on Thursday. I was on the road for work on my actual birthday, but I was able to catch dinner and record a podcast with my good buddies Serv and Jon from THE UNIQUE GEEK. When I got home on Friday, I celebrated with my family. Overall it was a pretty great birthday! I received several very nice gifts and I’ll be sharing the geek-centric ones here. While I won’t be showing the non-geek gifts, they were fantastic and sincerely appreciated! Tomorrow I’ll cover the new geek t-shirts I received and today I’ll cover the rest of my geek swag. From these posts, you’d think it was a seven year old celebrating their birthday. Well… I always say hold on to your inner child and let them run your life. You’ll be a lot happier that way. 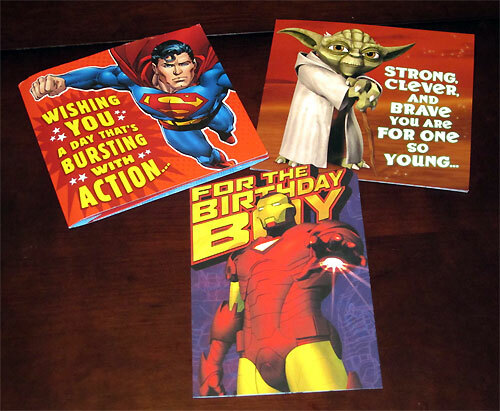 Knowing my outward-facing geek persona, my relatives always shop in the kids section for my birthday cards. I love it! Below you’ll see the Superman musical card from my mother and step-father, the Star Wars Yoda musical card from my father and step-mother, and the Iron Man card from my wife’s aunt and uncle. Great cards! 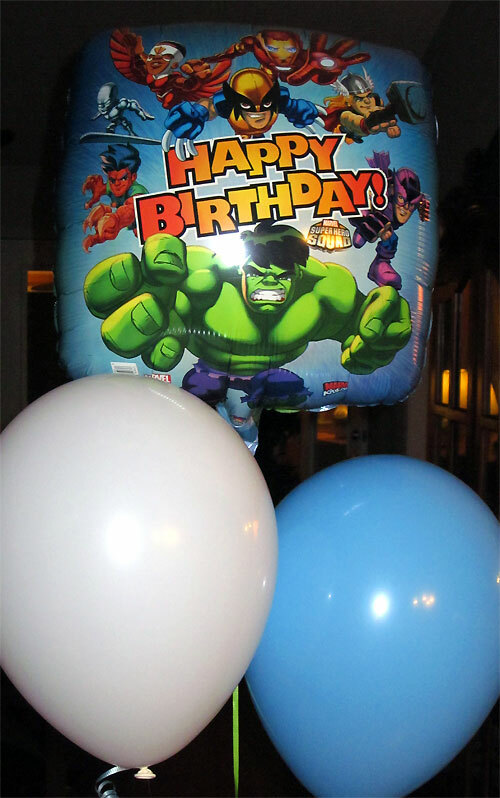 Next up is the Marvel Superhero Squad balloon picked out by my four year old daughter, the Precocious Princess. She’s such a sweetheart! 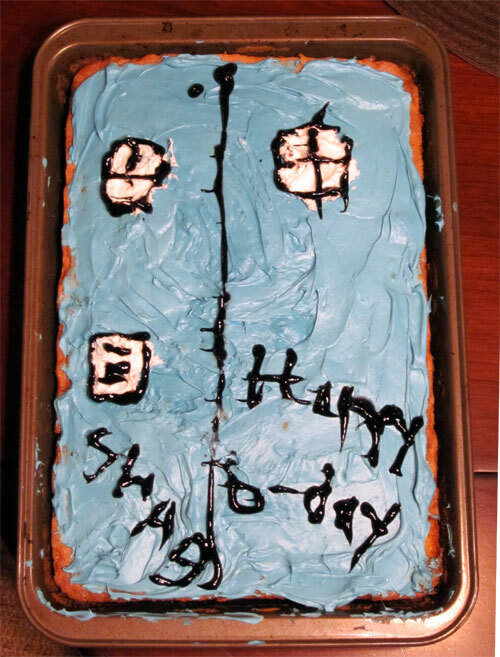 My ten year old step-son, the Rambunctious Rascal, baked me a Doctor Who TARDIS cake with some help from his grandmother! He conceived the cake design all by himself! Such an awesome cake! The final geek item for today came from my good friend Ed. 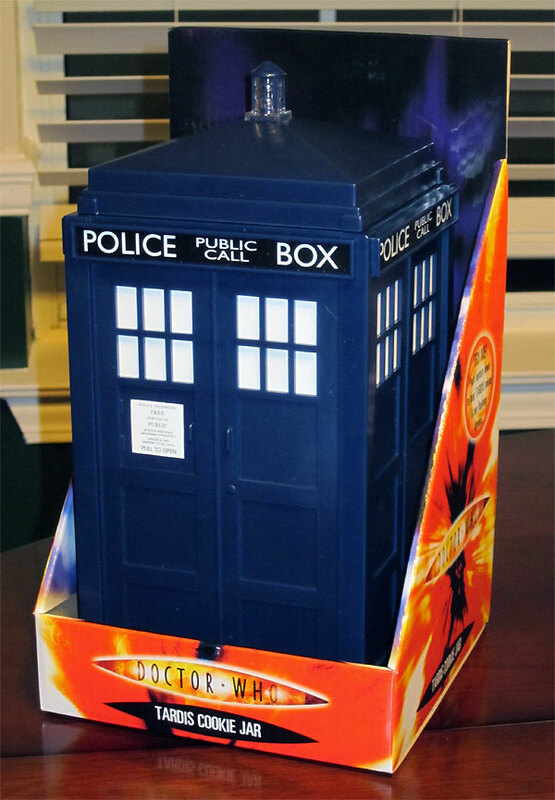 He sent me the Doctor Who TARDIS Cookie Jar from ThinkGeek! This thing is soooo cool! When you open and close the lid the light on top flashes and it plays the TARDIS dematerialization sound effect. Also, I’m pretty sure it’s bigger on the inside. Check out the photo and video below. Here is a video demonstration I did of the cookie jar. If you can’t see the embedded video below, please click here. Come back tomorrow to see the new geeky t-shirts I received for my birthday! Ya know, one thing that occurred to me was, if you actually use it, it is the perfect security against the Cookie Monster or little people who may try to snag a cookie without asking. Your stepson calls you Shag? Happy B-lated B-day! Mike the Janitor.